Guest post by Kate Tan , member of a Community Problem Solving group named “Project Wish” and member of the Singapore Academy of Young Engineers and Scientists. This is a re-post of her original blog here. When I tell people that I am part of a group whose mission is to raise awareness of the Butterfly Trail @Orchard in Singapore, I almost always get blank looks in reply, followed by comments about how it’s a waste of my time. Even more so, when I inform them that we target our education at children, because some think that ‘children are unable to understand or make any difference towards the situation’. Looking at the ‘Playing on Wings’ workshop we held on 16 June at Science Centre Singapore, I cannot see how people had underestimated children so much. With a group of about 30 children and their parents, the programme was meant to be a brief lesson about the importance of butterflies and urban nature in Singapore, and the dangers they face. Naturally, the activities, such as making origami butterflies and finding camouflaged butterflies in their natural environment, were uncomplicated and unable to touch on many of the very real problems butterflies and urban nature face in Singapore, such as lack of awareness and action. Somehow though, the kids got the message. “If it’s good for us, why don’t we care more?” A child, maybe eight or nine, asked us. The overly simplistic mind of a child is a unique insight you will not find anywhere else. No matter how much research we do regarding the matter, how many reports and essays we write about the multiple complicated causes behind the issues urban nature face in Singapore, it will never quite cover the crux of the problem quite as elegantly as the unassuming words of a child. “If it’s good for us, why don’t we care more?” Good question. The environment is important towards us, both as creatures who live off the Earth and her resources, and as practical humans who require natural resources for our own purposes. So why don’t we worry more about how it’s doing, about what we can do in return for it? It was a tough question to answer. We eventually came up with something about how adults have a lot of issues to deal with, and maybe sometimes forget about nature, which is why we want to remind them about it. Who says it’s merely the big, grand actions that make a difference? Appreciate the nature around you. Take a walk along Orchard Road and notice the seamlessly placed butterfly gardens. Perhaps take a stroll inside and find yourself overwhelmed by the sheer vibrancy of the flora and fauna around you, things you miss with your eyes glued to a screen. Plant a plant, take a picture, and if you like it, if you think it belongs in Singapore, if you think it’s important that your children is able to see it with their own eyes, spread the message. Let everyone know. Everything and everyone can make a difference. When we started this project, we were but a few teenagers with a goal and nothing else. Now, we are working with Nature Society Singapore (who founded the Butterfly Trail @Orchard), we have hosted a workshop with Science Centre Singapore, we are in collaboration with schools from other countries and, to me, this is proof that all it takes is passion and sincerity to make a difference. 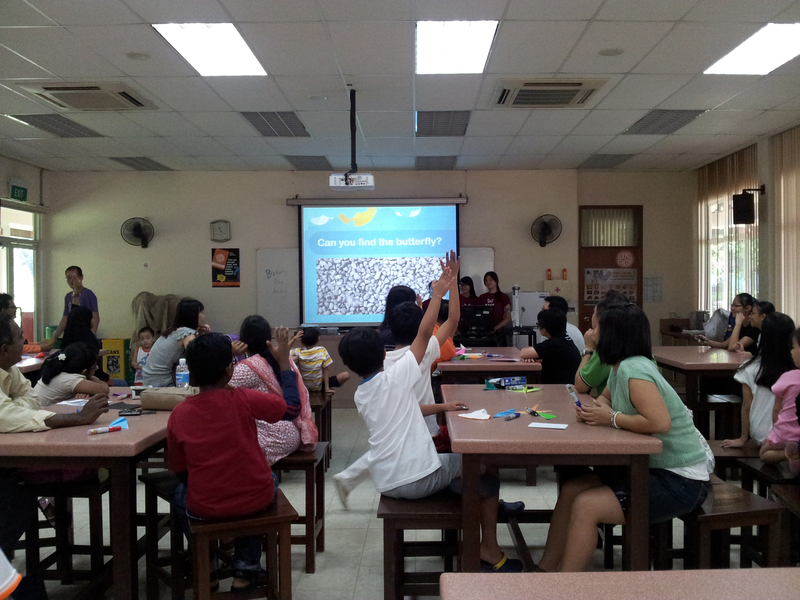 That day, twenty kids (and their parents) left the workshop having learnt about nature and butterflies in Singapore. That may be it, but I believe it made a difference. Maybe one day, one of those children may be the ones standing up and asking these questions and starting actual change. Or maybe not. I don’t know. But I’m not going to give up. The Butterfly Trail @Orchard is a project started by Nature Society Singapore (NSS), involving 15 butterfly gardens along Orchard Road. Do check out the NSS website for more details. Previous articleCLIMATE CHANGEWill you settle for "no other choice"?